Tannika King, Darlington's director of communications, is one of 11 local "unsung heroes" to be selected as recipients of the 2019 Heart of the Community Awards of Honor. “Tannika is blessed with outstanding people skills and leadership skills, and she tirelessly uses those to serve Rome and Floyd County," said Frank Beacham, who serves on the Sexual Assault Center of NWGA Board of Directors with King and who was one of several people to nominate her. King has called Rome home since 1991 when she moved from Edmonton, Alberta, Canada. She is a graduate of Rome High School and earned a B.A. in Communication from Berry College. She was named director of communications at Darlington in 2015 after serving as the school's director of media relations since 2004. She is also an advisor for a group of juniors. Other 2019 Heart of the Community award recipients with ties to Darlington are alumnus Chantz McClinic ('04, LD '14) and parents of alumni Barbara Beninato, Harry Brock, Nancy Knight, and Jeff ('85) and Mary Margaret Mauer. Honorees will be recognized on Saturday, Feb. 9, at the “Affair of the Heart” banquet, which is sponsored each year by the Heart of the Community Foundation and Redmond Regional Medical Center. Click here to read the Dec. 16 Hometown Headlines article about the 2019 honorees. 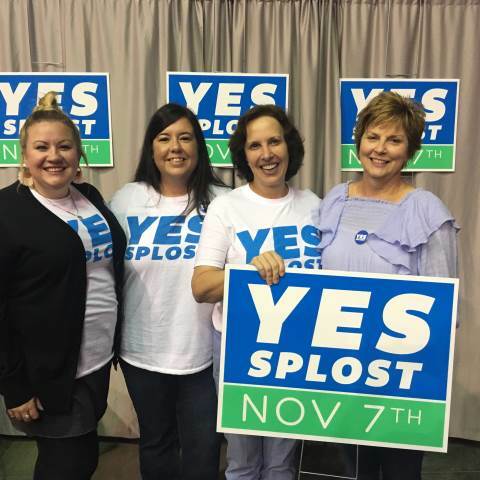 King was a member of Rome-Floyd Citizens for Progress (SPLOST YES committee) in 2013 and 2017.